Description: CSX 7762 is on the point of Q-271 at Ridgefield Park, NJ 7/2001. 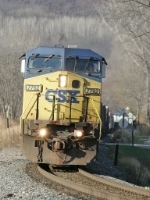 Description: CSX 7762 leads Q-491 in to Hamlet on January 1, 2006. Title: 2 New ES44AC's and more! Description: CSX ES44AC's and CSX C40-8W's pass through Amtrak's Depew Station! 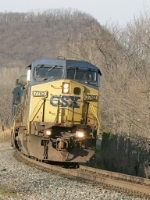 Description: Heading East on the CSX New Castle Sub.